Right leaners go nuts over Hoyer wall comments…. House Majority Leader Steny Hoyer, D-Md., acknowledged Wednesday on Fox News’ “Special Report with Bret Baier” that border walls “obviously” work in some areas, and he rejected suggestions that barriers should be removed where they already exist….. Please read the above, which has been reported ALL over the right leaning media…. 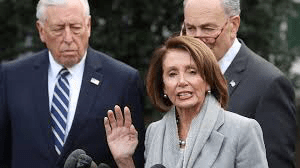 Hoyer IS NOT saying much of anything different that Speaker Nancy Pelosi…. She is NOT against signing off on more money for border security…. She is NOT against the concept of the existing border walls themselves…. House Majority leader Hoyer isn’t either…. With the rightwingnuts desperate for any toe hold they can get against the Democrats in Congress? I guess they’ll just copy Donald and just make stuff up….